Psychological Therapies Services (formerly known as Access to Allied Psychological Services – ATAPS) provides treatment for people that experience mild to moderate mental illness and have barriers to accessing mainstream treatment options. Brisbane South PHN has commissioned Wesley Mission Queensland and World Wellness Group to provide Psychological Therapies Services, as such Brisbane South PHN no longer handles central intake for these referrals. 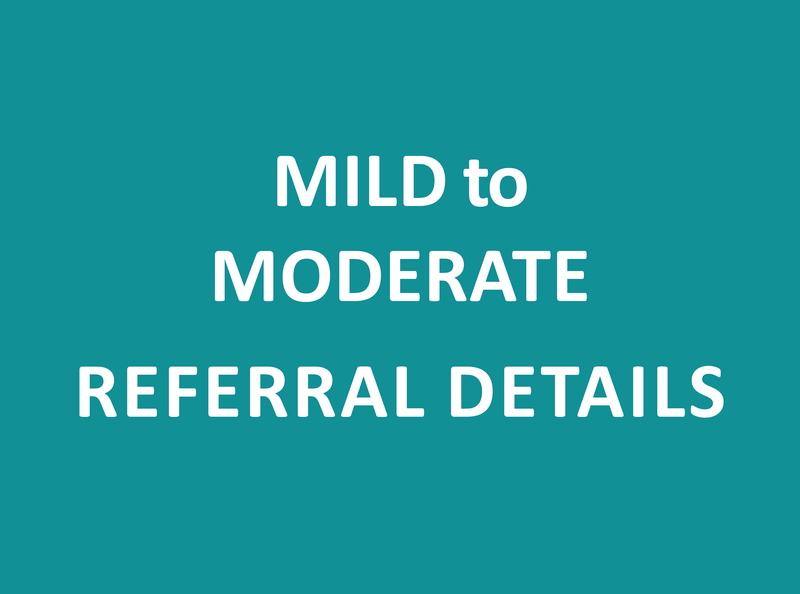 To download a fact sheet regarding the Psychological Therapies program, please click here. 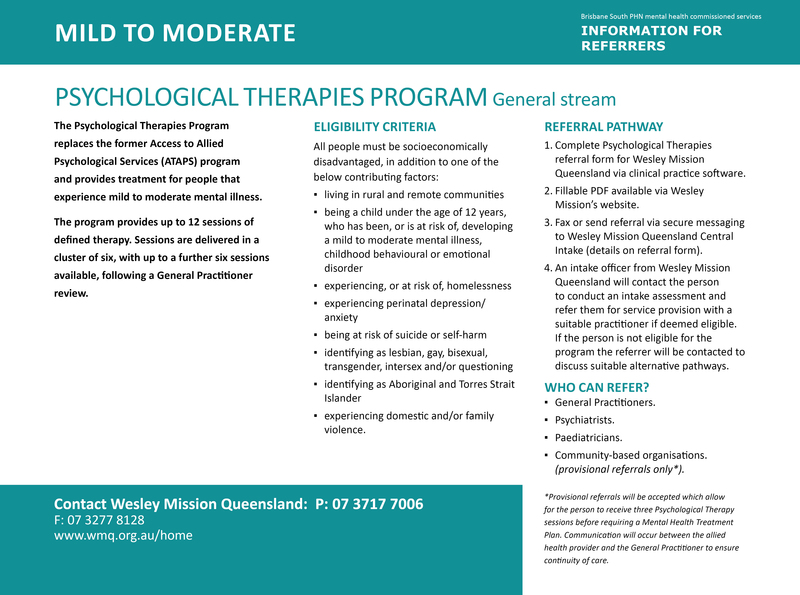 Wesley Mission Queensland will provide intake, assessment and triage as well as Psychological Therapies Services targeted to vulnerable and/or socioeconomically disadvantaged populations. 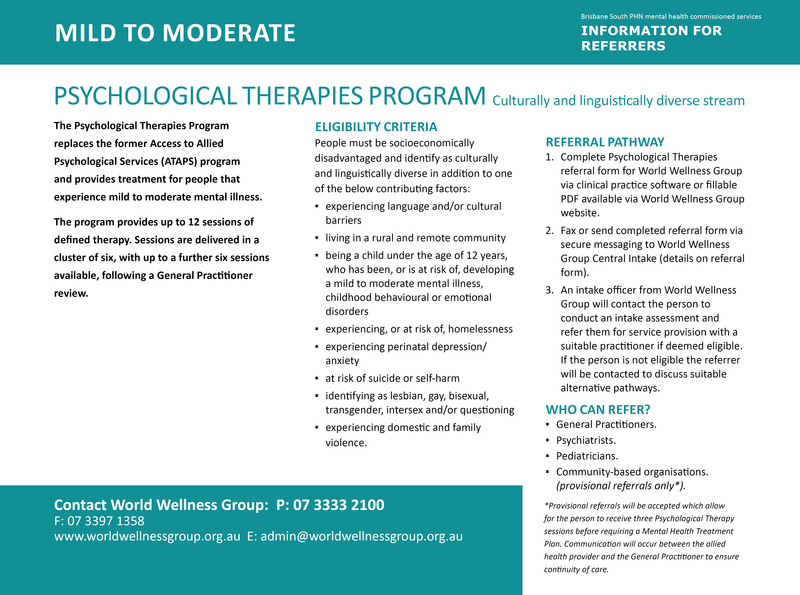 World Wellness Group will administer the Culturally and Linguistically Diverse (CALD) psychological therapies service including the intake, assessment and triage for corresponding referrals. Languages other than English spoken by our existing practitioners and bilingual co-therapists are Arabic, Tamil, Sinhala, French, Spanish, Romanian, Urdu, Hindi, Punjabi, Indonesian, Malaysian, Yoruba, Pidgin English, Cantonese, Mandarin and Swahili. experiencing domestic and family violence. Or call your local emergency service, Triple Zero 000.